Other than the fact that he’s not Canadian, Alexander Ovechkin perfectly checks off just about every hockey stereotype. Ovechkin is basically a human-wrecking ball with missing teeth, a big wild beard and now we know he basically doesn’t feel pain. We found that out last night because he barely even moved after a stray puck hit him in the jaw while he was standing on the bench and he barely moved. No joke, he gets drilled and then just slowly turns to see where the puck came from – Westworld conspiracy theorists are going to start thinking he’s a robot. With how injury news has been coming out since the end of the first round, we wouldn’t be surprised to find out that this broke his jaw and he immediately decided to just shrug it off. 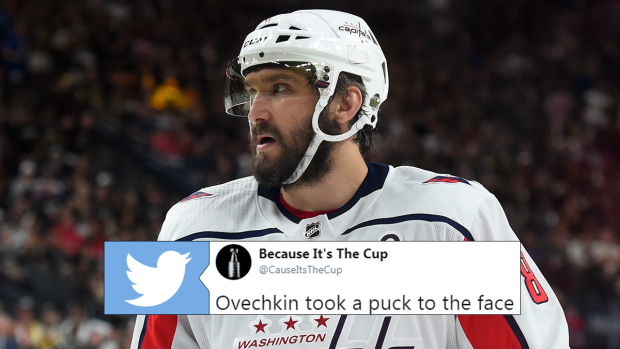 Ovechkin is going to do anything to avoid becoming a Ghost of No Cups past.